You are here: Home / FREEbies / FREEFill Fridays At RaceTrac! Sodapalooza lovers rejoice! 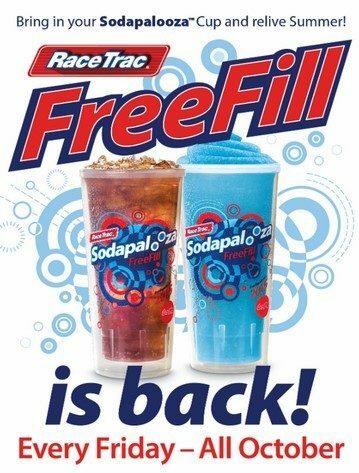 FREEFill is back every Friday in October at RaceTrac! Bring in your 2015 Sodapalooza Cup for FREE fountain and frozen refills on Friday, October 2, 9, 16, 23 and 30. Relive the glory days of summer with FREEFill Fridays!